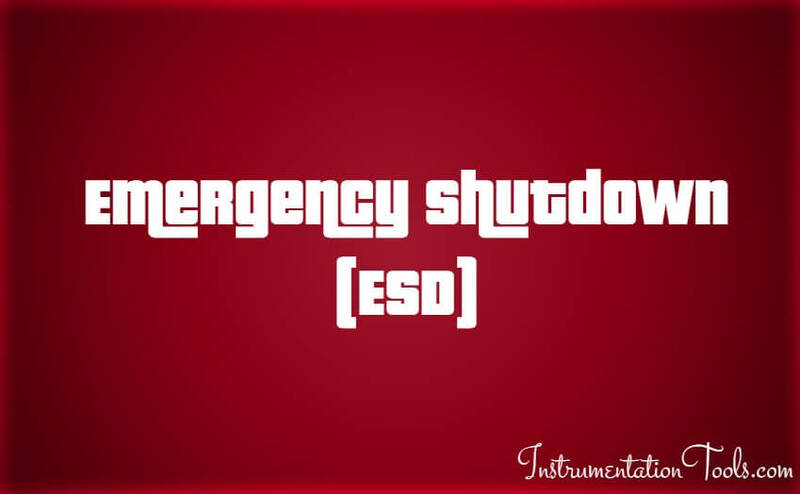 Home » What is Emergency Shutdown System (ESD) ? A critical condition for which immediate shutdown of the gas turbine and compressor is required and delayed shutdown options are not acceptable because of the danger posed to the compressor station, human life or physical damage to the equipment. Emergency Shutdown System (ESD) is designed to minimize the consequences of emergency situations, related to typically uncontrolled flooding, escape of hydrocarbons, or outbreak of fire in hydrocarbon carrying areas or areas which may otherwise be hazardous. An emergency shutdown system for a process control system includes an emergency shutdown (ESD) valve and an associated valve actuator. An emergency shutdown (ESD) controller provides output signals to the ESD valve in the event of a failure in the process control system. A solenoid valve responds to the ESD controller to vent the actuator to a fail state. A digital valve controller (DVC) test strokes the ESD valve. An impedance booster device enables the dc powering of the solenoid valve and the DVC over a two wire line while still permitting digital communication over the same two wire line. Traditionally risk analyses has concluded that the Emergency Shutdown system is in need of a high Safety Integrity Level, typically SIL 2 or 3. Basically the system consist of field-mounted sensors, valves and trip relays, system logic for processing of incoming signals, alarm and HMI units. The system is able to process input signals and activating outputs in accordance with the Cause & Effect charts defined for the installation. Since ESD System is built on the same control platform as the Process Automation System, you can address your process control and functional safety needs with a common control platform. A single Control System can be used to develop both process control and functional safety applications. Static analysis tools are provided to assist in the verification and validation of the safety strategy. With a single platform and software workbench, Esoteric can provide solutions for Process, Discrete and Functional Safety applications, reducing the need for spares, training and support and providing considerable savings.